Katie was born in Douglasville and grew up surrounded by dogs, cats, horses, and many exotic animals. For as long as she can remember, Katie has always wanted to work with animals and has a passion for helping animals and people. 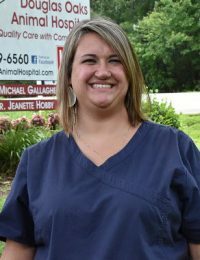 She has spent 10 years in the veterinary industry. When she is not working, Katie enjoys spending time with her husband and twin boys. Her hobbies include camping, shopping, and just enjoys being outdoors.